The big annual meeting is almost here. Today, I’m highlighting four items up for vote likely to prompt queues at the microphones. There’s info on each worth updating since my past coverage. 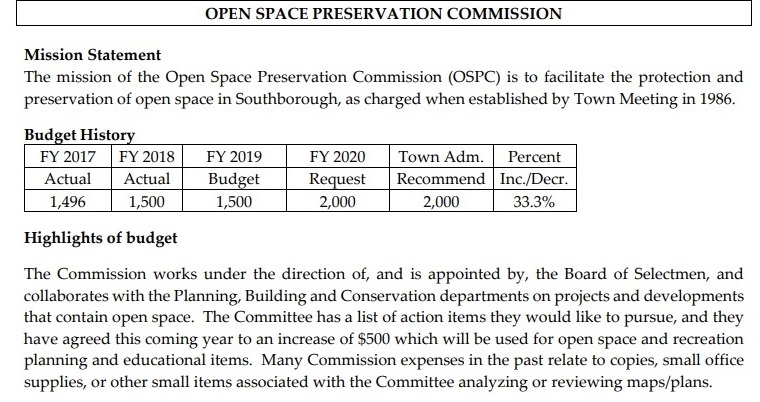 At Town Meeting, expect Selectman Dan Kolenda to ask to block a budget increase for the Open Space Preservation Commission. On Tuesday, Kolenda failed to convince fellow members to transfer $500 from OSPC’s recommended budget to Youth and Family Services. He told the board that he plans to ask voters to amend the budget. The board voted to not revisit budget decisions already worked out. Selectwoman Bonnie Phaneuf reminded that she sat down with a member of OSPC to come to a consensus on a budget compromise. 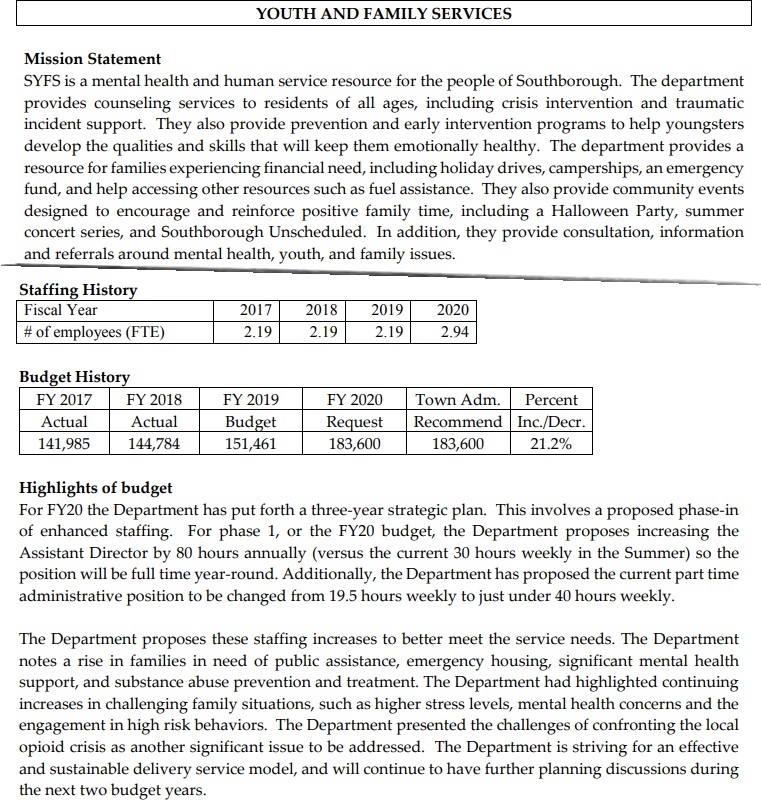 She also helped work through a revised ask for SYFS’ budget. Chair Lisa Braccio said she understood where Kolenda was coming from. But she supported the OSPC budget and was satisfied with this year’s increase to SYFS. I’ve included information below from the Town’s recommended budget book explaining how budgets are used. Click thumbnails to enlarge. Another attempt to get approval to fix Kallander Field will be back in front of voters this weekend. But there are significant differences this time. Those include a much lower price tag. Kallander is one of the Town’s soccer fields. It has been plagued by flooding issues contributing to field disrepair. Last year, Recreation originally asked for $267,400 for a project that included grading, sodding, installation of drainage and repairs. Selectmen and Advisory were unhappy with the Recreation Commission for trying to bypass the planned out Capital project process. Last April, Recreation brought the project to voters through one of its Articles outside of the budgets. When it failed, the commission used a Citizen’s Petition to bring a revised $248,300 project back to voters in May. It was voted down again. Still, the process and cost weren’t the only issues voters had with last year’s Article. Given the amount of debate last spring, I’m not expecting this to pass without some questions. Last spring, there were disputes between Recreation and vocal residents on the cause of issues. Some residents opined that unresolved issues uphill from the field and other factors would lead to the project being a money pit. Recreation hopes that the new phased plan will pass muster with residents. Based on discussion by selectmen, it sounds like Rec would need approval from BOS and Advisory at specified stages in order to continue spending on the project. I don’t have the details but Recreation Director Doreen Ferguson tells me that the Commission is prepared to answer voters’ questions on Saturday. In preparation for ATM, some Town Officials already talked through the project with one of its past opponents. Braccio said she, Phaneuf, and Public Works’ Karen Galligan sat down with Southborough Open Land Foundation President Whitney Beals to answer questions. I previously shared that the majority of selectmen hoped to amend Article 22. This week, they learned that may not be allowed. The board discussed the Moderator’s decision. The Library’s Board of Trustees have been working on a project to restore the historic 1911 section of the Library and protect it from further erosion. They are seeking Community Preservation Act funds for the work. The Community Preservation Committee approved bringing the over $1M project to voters, but with a caveat. If significant funds from the historic preservation bucket are going to be committed to restoring the building’s facade, the CPC wants that facade preserved “in perpetuity”. Selectmen Kolenda, Phaneuf, and Brian Shea support CPA funding the work. But they oppose tying the Town’s hands as to what they can do with the building down the road. CPC’s Chair Freddie Gillespie rebutted that they could use non-CPA funding for the project if it’s just regular building maintenance. Shea recommended amending the Article to remove the preservation clause. Gillespie said she didn’t believe that was allowed. She argued that the Article needs to be as approved by CPC. She furthered that such an amendment wouldn’t fall within “the four corners” of the Article. Town Administrator Mark Purple opined that it would be the Moderator’s call. This week Purple updated the board that the call was made. After looking at information from CPC and the state, Moderator Paul Cimino purportedly ruled that an amendment isn’t allowed. The TA answered that Town Counsel had been copied on the decision but hadn’t given an opinion. Selectmen asked Purple to get Counsel’s opinion. Depending on that answer, expect the board to either propose an amendment or to oppose the Article. No plan has been publicly proposed by selectmen for how to fund necessary fixes to the building if the Article is voted down. You can read more about the project and the Library’s deterioration issues here. The Warrant includes seven Citizen Petitions. Each is likely to spark at least a little back and forth. (The majority of selectmen oppose them and clearly some Citizens support each or they wouldn’t be on the Warrant.) But the one that I’m confident will be debated is Article 35. These are just the controversies I’ve noticed brewing. But most years, I find myself surprised by a debate over something I didn’t expect to be controversial. So, is there something else on the Warrant that you think will provoke a debate? Comment below. Nix any money for Kallander Field – we’ve ALREADY voted on that. This is the typical strategy for getting some useless project passed. Voters vote it down – once, twice, etc. Somebody doesn’t like the results so it’s presented again. In the worst scenario, some political group simply ignores the vote and votes contrary to public opinion. Is this democracy in action? The field is in an unfortunate location. Use other fields. How about one of the many empty fields owned by Fay or St. Marks schools? FILOT – Fields In Lieu Of Taxes?